Shutterstock Venezuelan President Nicolás Maduro speaks to a crowd in Caracas, Venezuela. Bringing up the current political situation in Venezuela often produces strong reactions. 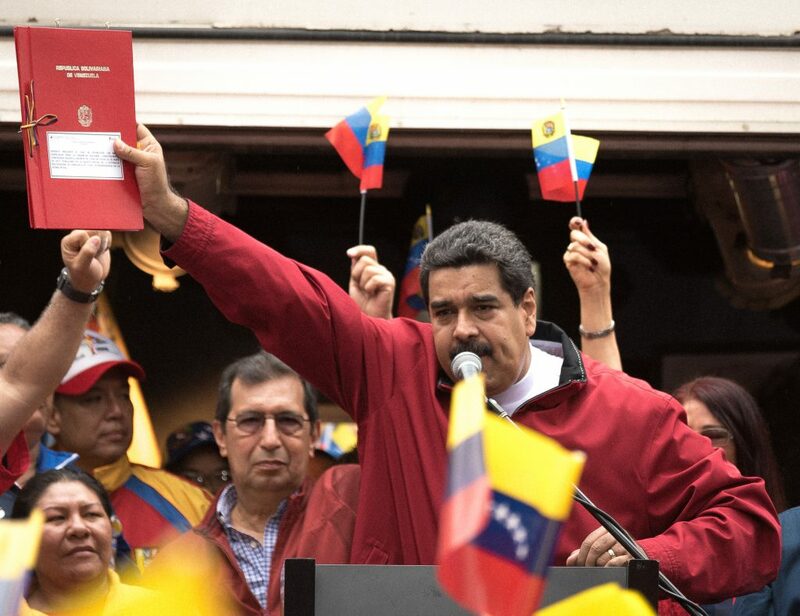 People either immediately condemn Venezuelan President Nicolás Maduro and support U.S.-backed opposition leader Juan Guaidó’s attempt to take over, or express skepticism about the United States’ interest in changing Venezuela’s leadership. What both sides have in common, though, is that their views are largely shaped by media representation of what’s happening in Venezuela. Here’s the problem: If the United States has its own interests — propping up a leader who will cooperate with the United States — how do we know that mainstream media remains unbiased in its reports on Venezuela? We don’t. In fact, we have good reason to assume mainstream media deliberately misrepresents the situation. All of this certainly makes the case for U.S. intervention in Venezuela. However, it’s not quite that simple. When mainstream media circulated the news that Maduro’s forces set fire to humanitarian aid, a video emerged showing that opposition forces started the fire, not Maduro’s people. Accusations that Maduro blocked a bridge to prevent humanitarian aid also missed important context, including that the Red Cross and United Nations both advised the United States “not to engage in this aid PR stunt” and that “the person in charge of US operations in Venezuela has a history of using aid as a cover to deliver weapons to right-wing mercenaries,” according to the Global Justice Equality Project. In addition, mainstream media often represents the majority of Venezuela as supporters of Guaidó, but never shows pro-Maduro rallies and gatherings. Moreover, The New York Times’ video with Hausmann failed to disclose that she is the daughter of Guaidó economic adviser Ricardo Hausmann. Not only did The Times spread information that is likely skewed since it comes from an opposition leader’s daughter, but it also fell into the trap of only telling the story of Venezuela through the lens of a white, well-off Venezuelan whose experiences are certainly not representative of poor and working-class Venezuelans. This is noteworthy because history has shown that U.S. invasions in Latin America hurt poor and working-class citizens the most. Before I get accused of peddling conspiracy theories about “Fake News,” this is something the United States has done before. Look no further than what happened during the 1989 U.S. invasion of Panama. The Academy Award-winning documentary “The Panama Deception” details the history of U.S.-Panama relations and accuses the United States of using the invasion to regain control of Panama after Panamanian leader Manuel Noriega outlived his usefulness. Before the invasion, the CIA had worked closely with Noriega as a valued paid informant and regarded him as an ally, especially concerning the U.S. war on drugs. Since he was an asset to U.S. interests in Latin America, the U.S. government was willing to look the other way when Noriega profited off drug trafficking and assisted in money laundering. However, once Noriega stopped cooperating with the United States, intervention was imminent. The film details that the United States imposed economic sanctions, gave Noriega’s opposition in Panama more than $10 million and, finally, deployed U.S. military personnel to patrol and ultimately provoke Panamanians into attacking them to justify retaliation. According to the documentary, after a group of U.S. Marines known as the “Hard Chargers” — whose goal was to purposely provoke Panamanian forces — was attacked by Panamanian guards and one Marine was killed, the U.S. administration had the ammo it needed to invade. The first night of the invasion, U.S. troops simultaneously attacked 27 targets, with many in densely populated areas. The true number of Panamanian civilian casualties is unknown; the goal was only to capture Noriega. The film goes extremely in-depth about the invasion, but the main point is to highlight the U.S. government’s motives in the invasion of Panama as well as show the complicity of mainstream media, which provided virtually no challenge to the U.S. government’s account of the events. The media stirred the pot and mobilized Americans and the world against Noriega, portrayed Panamanians as happy about the invasion and neglected any mention of the invasion’s greatest victims: poor and working-class Panamanians. With this knowledge, how can anyone trust the mainstream media’s portrayal of the situation in Venezuela? In no way am I implying that there aren’t people in Venezuela who are suffering under Maduro’s rule. Even if that’s true, though, we cannot ignore the United States’ track record when it comes to Latin American leaders who don’t bend to the United States’ will, nor can we forget the uncritical media coverage that usually follows. It’s naive to think the United States truly has the interest of the Venezuelan people at heart. Frankly, if the Trump administration did little to aid Puerto Rico — whose inhabitants are American citizens — after Hurricane Maria, how could anyone possibly believe it cares about Venezuelans? At this point, mainstream media companies are highly corporate and have bases and interests to cater to. I encourage people to seek out smaller, independent media if they want a better look at not only Venezuela, but any global affair whose media coverage may be skewed due to big money or connections to a government. After all, before The New York Times debunked the burning-aid conspiracy almost two weeks after the story broke, independent journalists published the damning video the same day it occurred. Stay skeptical of mainstream media, and keep your eyes on Venezuela.